Post Card is a brand of Postal Savings Bank and it is a cobrand with DinaCard, a national debit payment card and a RSD current account ID card.  You may use Dina Post Card debit payment card for the payment of goods, services and the withdrawal of cash at places displaying DinaCard logo in Serbia. Payment with Dina Post Card has all the same advantages as payment by checks but it is significantly quicker and simpler. Who can use the installment buying facility? The right to the installment payment facility with Dina Post Card may be exercised by a holder of a RSD current account with Postal Savings Bank who is employed for an indefinite period of time or who is a pensioner. In order to use the facility to pay in installments, it is necessary for the user to choose the number of installments at the point of sale providing the service. The users, who use the SMS notification service of the Bank, will receive a free message about the due date of the installment for the purchase made with a Dina Post Card one day prior to the due date. The account shall be debited on the installment due date when the user should provide the cover for the installment collection rather than the funds being reserved at the time of purchase. The total amount of the purchase cannot exceed the monthly amount of a salary/pension, and the total amount of all installments during a month must not be higher than 30% of the salary/pension when making payments with Dina Post Card. It is recommended to users to contact the Bank prior to making installment payments in order to receive information regarding the available funds in their accounts and their purchase limits. You can check the maximum amount and the approved monthly debit when buying in installments with Post Card by using the Internet Banking System of Postal Savings Bank. Average monthly salaries in the amount of RSD 30,000, with a maximum possible amount of monthly debit (30%) for the installment buying in the amount of RSD 9,000, have been calculated in this example. Below is an example of two monthly installment purchases. When the installment purchase has been paid in full, the user’s debited monthly limit shall be reset accordingly.